Yup, the title says it all. Today I’m drinking two different kombucha teas that were intentionally made to resemble root beer (and don’t). Live Soda Kombucha is one of the more flavorful and drinkable kombuchas I’ve encountered, though I’ve admittedly only had maybe 12 or 15 brands of kombucha so far (if there even is more than that). It’s similar to soda in texture, but the flavor is harsher and the brewed probiotic tea gives it an all new gritty taste. Live Soda Kombucha’s Revive Rootbeer is a pretty decent approximation, but to make a bad pun it “falls flat”. Revive Rootbeer is made up of: organic fair trade raw kombucha, organic fair trade evaporated cane juice, organic kombucha culture fermented in purified water, natural flavors (i will seriously never understand what that means) and organic stevia extract. So it has basically no root beer ingredients. *shrugs* It’s not bad. 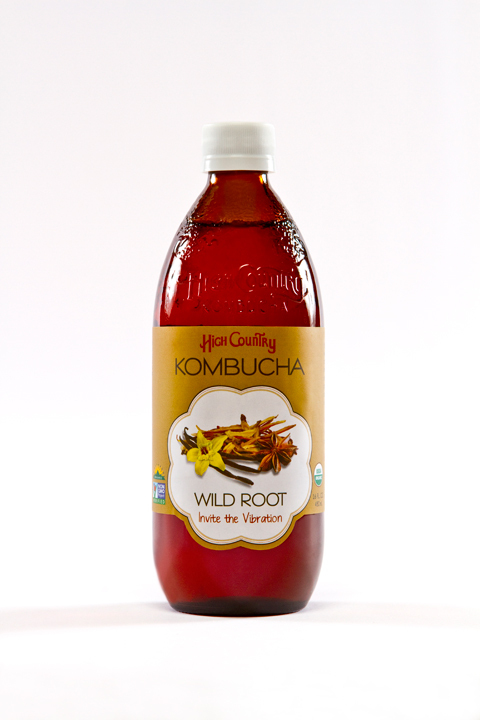 Then there’s High Country Kombucha‘s Wild Root. According to the label, “Wild Root: Invite the Vibration – a root beer like no other. Fiercely original. Shockingly delicious.” So I will agree to every statement but the last one. I’m not sure i can do this flavor justice. While not quite as harsh as their Elderberry and Hibiscus, Wild Root is nevertheless extremely difficult to drink. I would include a warning not to gulp this beverage–anything greater than a sip will induce coughing. As a kombucha it’s efficient and bubbly in my stomach. As a flavorful beverage i would give it maybe a 2 out of 10 stars? The explosive burning taste is unique and i guess i kind of understand where they’re coming from in that it has an aftertaste not unlike root beer. However, in no way does Wild Root resembles root beer. I would go so far as to not wish this drink on my worst enemy. Funny, since I’ve already recommended their aforeblogged Elderberry Hibiscus to my beer-loving brother. Cheers!